How are we all this sunny morning yet again!!!! Another beautiful card in great colours. I love the cute image - it's so sweet. Another lovely creation - I love the layout - gorgeous. Its nice to see your photo background too - what a view (so jealous) its glooming and raining here in Essex at the moment and its suppose to rain all day too - lovely! This cat is such a cutie.....think I might just have to buy him! Lovely card Sylvie. What a gorgeous card, I love the image, hes coloured beautifully. Great layout too. Hi Sylvie. this is just soooooooo gorgeous. 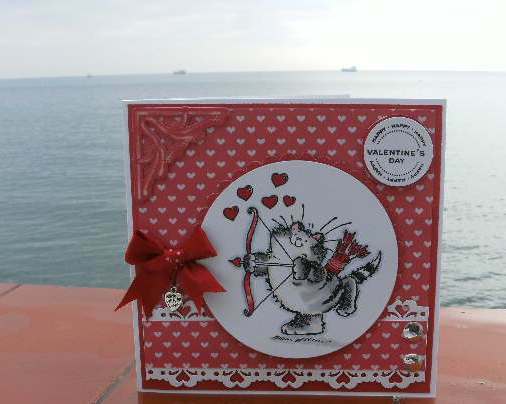 What a cute, gorgeous card Sylvie. Another fabby card, thanks for joining us at Penny Black this week. Such a cute card. I really like the dp you used and your coloring is wonderful.